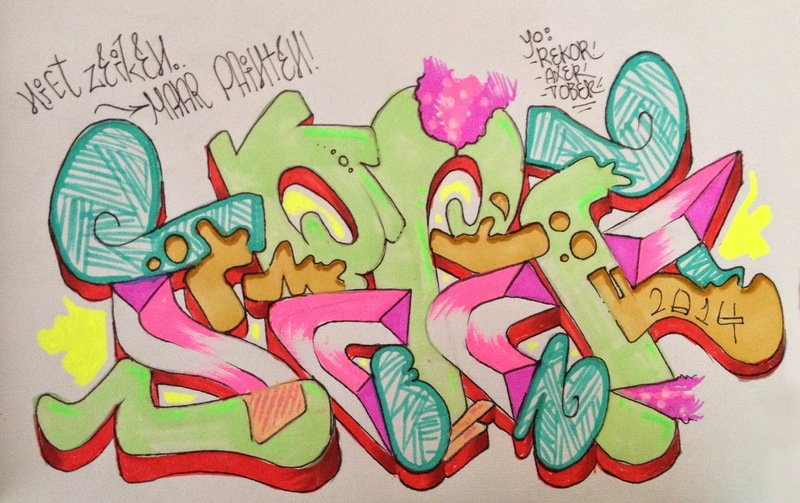 GRAFFITI SKETCH EXCHANGE - SECK1 x TREM! HOF DAY @ DELFT - FT. FINES, TOBER, TREM & BUNO! GRAFFITI BLACKBOOK SKETCH - UNEXPECTED GIFT! FREE PDF DOWNLOAD - NS MATERIEEL '64! Ha, a Dutch title on this one. Been talking with the guys Rekor, Axer & Teek, about collaborations, and where they should take place. We just can't get a compromise. That's why the title is 'Niet Zeiken, Maar Painten', which roughly means 'Stop Whining, Just Paint', haha. Took the picture today, but the sketch is from last night. A little halloween tweak on the brown fill splats, enjoy!